One of the most important objectives of FAR’s Breaking the Cycle of Poverty Program (BCPP) is to encourage positive life changes for young people. The lack of entertainment and everyday activities along with socio-economic hardship in the impoverished Tavush Province drives more and more young people each year away from their home villages to Yerevan and abroad in search of greater opportunity. As part of the program’s initiatives to engage young people in their communities, FAR’s staff organize a variety of activities for children and teenagers, who they brought together many times throughout 2015. The last two meetings held in December centered around a poetry and “KVN” drama competition. 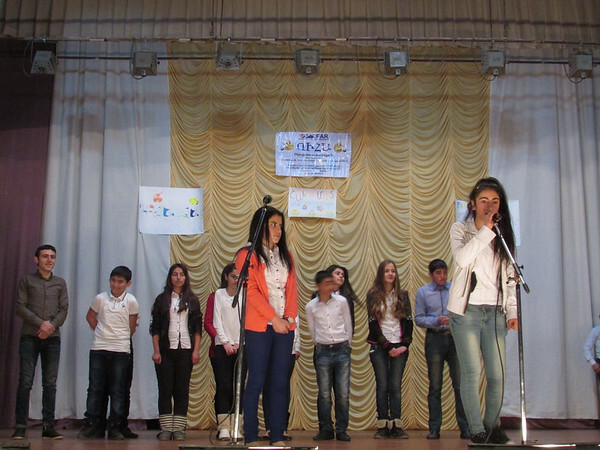 Thirty-five teenagers participated in the poem reading competition, which was organized by FAR’s Berd Office and the Berd City Library. “People in Tavush are very talented and creative so we decided to give them an opportunity to express themselves. The competition had two parts. Kids could read their own poems or poems by famous Armenian authors. It was so wonderful. Young people even suggested that we organize it periodically,” said Berd Social Worker Astghik Hakobyan. Nare Tsaturyan from Berd City received first prize for her poem My Heart is Frozen for You, while Hayk Qalantaryan from Choratan was first for reading Vahagn Davtyan’s Morning Light. All received certificates of participation. Children from Varagavan, Chinari and Paravaqar villages joined in the “KVN” competition, which was held at the Berd Cultural Center. Each team presented skits about their villages, demonstrating its advantages and disadvantages using humor, which spread laughter throughout the auditorium. The jury evaluated Chinari’s presentation as the most ingenious, Paravaqar’s as the most intelligent, and Varagavan team’s performance as the overall best. “This was a great event that helped to bring joy to the children. They used humor to fight the feelings of sadness or depression they might be struggling with, as well as the anxiety they feel from hearing gunfire everyday along the border with Azerbaijan,” said Raisa Voskanyan, whose children Armen, 22, and Varduhi, 16, from Chinari took part in the day’s events.